The analysis of structural frames requires the solution of large sparse matrix systems, which rapidly becomes very time consuming using a VBA based solver, especially for 3D analysis. I have previously presented versions of my frame analysis spreadsheet that link to compiled solvers (in Fortran, C++, and C#), but these have still required the generation of the complete matrix, consisting mostly of zeros, which needlessly limits the size of model that can be handled. The Python Pysparse library contains a number of formats for handling and storing sparse matrices, and importantly for frame analysis, an iterative solver for sparse symmetric matrices. I am now working on adding this solver (and also a sparse direct solver) to my frame analysis spreadsheet. This post looks at how to generate the matrix data in Excel, and how to link this data to the Python routines, using Pyxll. Import the data from Excel as a Numpy Array. Process the data in linked list format. Return the results to Excel as a Numpy_column array. The stiffness matrix is defined in three columns, two defining a pair of freedoms (the row and column number of the full matrix), and the third the associated stiffness value. 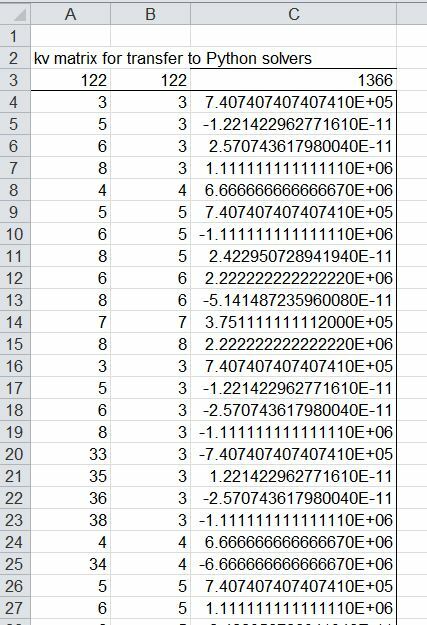 This data is generated by a VBA routine from the spreadsheet by calculating the freedom values for each beam in turn. This results in many freedom pairs being repeated, with stiffness values that must be summed to find the resultant stiffness value for the global matrix. This is done in the ll_mat_from_array routine, which creates a linked list matrix, then simply steps through the input data and adds the stiffness values for each of the freedom pairs. The linked list array is then converted to sss (Sparse Skyline) format with the method .to_sss(). Finally this array is preconditioned, solved, and the resulting array of node deflections is returned to the calling VBA routine. In this case the linked list array is converted to a csr (Compressed Sparse Row) format, and the resulting array is then factorised and solved using the superlu routine. This entry was posted in Arrays, Beam Bending, Excel, Finite Element Analysis, Frame Analysis, Link to Python, Maths, Newton, NumPy and SciPy, VBA and tagged Excel, Frame Analysis, PYsparse, Python, sparse matrices, VBA. Bookmark the permalink.